SuretyGroup.com writes surety bonds for auto dismantlers. Take A Guess … What Is The #1 Recycled Product In The US? Typical guesses might include aluminum, paper products, plastics or glass. But one material is recycled more than all those combined … steel. Around 14 million motor vehicles are taken off the roads every year in the US, resulting in about 14 million tons of steel being recycled. This makes motor vehicles the most recycled consumer product in the US. Vehicles can get totaled in accidents, natural disasters or just driven for years until they can’t go another mile. But that doesn’t mean their lives are done just yet. They could end up in a salvage yard, where an Auto Dismantler recycles as much as possible. Re-usable parts are extracted and sold. Toxic chemicals like Freon, asbestos, mercury, oil and antifreeze are safely removed. Most of what is left is recyclable steel. It’s a win-win situation. The public has access to inexpensive used car parts, which can be 70% cheaper than buying new. The environment benefits because recycling steel uses around 75% less energy than producing new steel, and the vehicles don’t end up in landfills. And the economy benefits when Auto Dismantler businesses create jobs. Because Auto Dismantlers have access to items such as car titles, license plates and toxic chemicals, some states want to make sure all their laws and regulations are followed. They require a Surety Bond for Auto Dismantlers. The bond guarantees that Auto Dismantlers conduct business ethically and lawfully. In Alabama, Dismantlers need a “Bond of Automotive Dismantler and Parts Recycler.” This bond must be renewed on Oct. 1 of every year. Bonds for Georgia Auto Dismantlers are 2-year bonds that renew on Dec. 31 of odd-numbered years. The bond covers Rebuilders, Salvage Dealers, Dismantlers and Used Motor Vehicle Parts Dealers. If you are an Auto Dismantler and your state requires a surety bond, you must purchase it from a Surety through a licensed agent, such as SuretyGroup.com. Wow, I had no idea that 14 million cars are taking off the road every year here in the U.S. 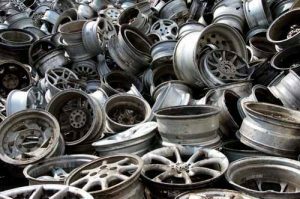 It makes perfect sense that steel would be the number one recycled material in the country and that there are so many different kinds of reusable car parts that are extracted and sold. I’ll have to look to some of these places and see about finding some parts for a car that I’m working on right now.